David Goffin is one of the best Belgian tennis players at the moment and the first one, who reached the ATP Top 10. David is the winner of 4 ATP titles. He reached his highest position in the ranking of #7 in 2017 after getting to the final at ATP World Tour Finals. David Goffin was born on December 7, 1990, in Rocourt, Belgium. At the junior level, he reached #10 in the junior combined world rankings. He took part in French Open and Wimbledon, but lost in the second and first rounds correspondingly. In 2011, Goffin won his first ATP match at Chennai Open. 2012 was the breakthrough year for the athlete. He reached the quarterfinals at Chennai Open, last 16 at French Open as well as the 3rd round at Wimbledon. In 2014, David Goffin won three Challenger titles as well as his first ATP tour-level title at the Austrian Open Kitzbuhel, defeating Dominic Thiem in the final. Later that year, he became the winner of the Moselle Open in Metz, beating Joao Sousa in the final match. Also, the athlete got to his first ATP 500 tournament final at the Swiss Indoors after gaining his first victory over Top 10 player, Milos Raonic. However, he lost in the final to Roger Federer. That year, he was awarded the Comeback Player of the Year award by the ATP. In 2015, the tennis player reached the world’s top-20 after getting to two ATP finals and showing good results in the major tournaments. In 2016, he already reached top-15 after getting to the semifinals at Masters 1000 and Miami Open, quarterfinals at Rome Masters and French Open. 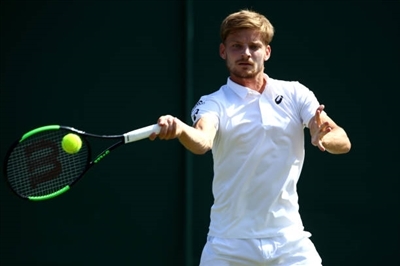 In 2017, Goffin reached his highest ATP ranking of #7. He won Shenzhen Open and Tokyo Open, his first ATP 500 title. He was a finalist of the World Tennis Championship in Abu Dhabi, where he lost to Rafael Nadal, Sofia Open (lost to Grigor Dimitrov) and Rotterdam Open (was defeated by Jo-Wilfried Tsonga). David was also a finalist at ATP Finals, but lost to Grigor Dimitrov. However, on his way to the final, he beat Rafael Nadal and Roger Federer, becoming the 6th player to beat these two players at the same event. Moreover, the athlete reached the semifinal at the Monte Carlo Masters and the quarterfinal at the Mutua Madrid Open. In 2018, the Belgian got to the semifinals at Open Sud de France and Rotterdam Open. Playing at the latter, Goffin had to retire from the match because of the eye injury. That season, he had to miss Marseille Open and Indian Wells.